International commercial arbitration raises issues other than the choice of the law applicable to the principal contract. Autonomy may have a wider meaning, extending beyond the choice of applicable law to the choice of arbitration itself, and of the place or places where it is to be conducted. Nor is it altogether clear what the forum is, if any. 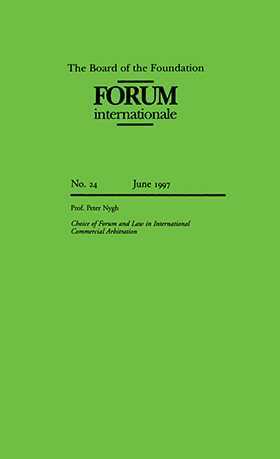 This paper raises the fundamental question of what gives the arbitrator his or her competence--the will of the parties or the law of the seat of arbitration which the parties may, or may not, have chosen? The paper also suggests an answer to the questions of which choice of law rules, if any, should be applied by the arbitrators, to what extent arbitrators will apply mandatory rules (règles d'application immédiate), as well as which law governs the procedural aspects and whether it has to be the procedural law of a national system. The new English Arbitration Act 1996 has also been taken into account. Does Arbitration Have a Forum?